Papaya fruit comes in the form of all sort of shapes. But, most of the times, they look like elongated melons, or pears. The common variety comes with huge amount of seeds, while the newer variety nowadays even comes with seedless. Most importantly, they must have an abundant volume of flesh. Papayas are abundantly found in most of our marketplace and are easy to grow. Besides, it is also a relatively cheap fruit. The flesh is deliciously sweet and its texture has a soft and smooth quality. The papaya fruit itself, seeds, latex, and leaves are known to contain a toxic substance called Carpaine. This is an anthelmintic alkaloid which could be harmful if taken in high doses (Carpaine, when consumed in large quantities, may lower the pulse rate and depress the nervous system). However, in other cases, an excessive consumption of papaya (such as red carrots too) can cause carotenemia (the yellowing of the soles and palms), which is otherwise harmless. 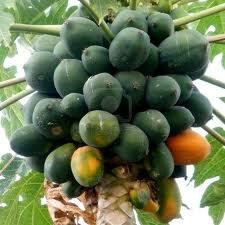 Other nutritional value of the papaya fruit, is its proteolytic enzyme called Papain. This is an excellent aid to digestion (particularly, the elders in our families). They said it is so powerful that it can digest an amazing 200 times its own weight in protein. Nevertheless. it also assists our body's own enzymes in assimilating the maximum nutritional value from the food we eat. Since the olden days, Papain has also been used as an immediate home remedy treatment, such as jellyfish sting and any other type of wounds (even surgical wounds). They said the highest concentration of this substance is on the skin of unripe papayas. Usually, the skin is sliced and then, apply directly onto the affected area. Papaya is indeed a wholesome fruit. It has a rich source of anti-oxidant nutrients namely beta-carotene (its orange color. The greener papaya would not contain this carotene). 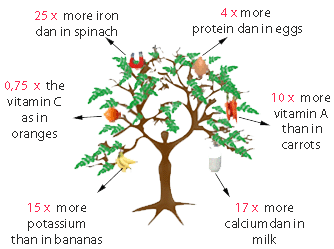 It also contains vitamin A & C, flavonoids, B vitamins, folate and pantothenic acid, including a smaller amounts of other minerals, such as calcium, chlorine, iron, phosphorus, potassium, silicon and sodium. Incidentally, a ripe papaya will also provide an abundance of energy-boosting natural sugars. It is known to greatly reduce inflammation in diseases, such as rheumatoid arthritis, osteoarthritis, gout and asthma. Its rich fiber will bind to cancer-causing toxins in the colon and is eliminated from the body during bowel movements. Its fine and natural laxative virtue will aid digestion. Taken regularly, it can help habitual constipation, bleeding piles and chronic diarrhea. Regular consumption of papaya juice will benefit from its high vitamin A content (especially beneficial for smoker, or if you are frequently exposed to second-hand smokers). It reduces lung inflammation. 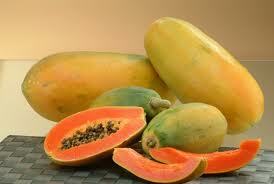 The powerful content of anti-oxidants in papayas will help to prevent the oxidation of cholesterol too. Oxidized cholesterol will form dangerous plagues which will lead to heart attacks, or even strokes. The papain in unripe papaya is extremely helpful for those who are deficient in gastric juice and those who have excess of unhealthy mucus in the stomach, dyspepsia and intestinal irritation. It helps to contract the muscle fibers of the womb, assisting in proper and regular menstrual flow. It is especially helpful in cases of menstruation cessation in young ladies, as a result of coldness, or trauma. 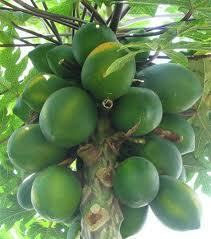 Skin Diseases : The juices from unripe papayas is useful to treat skin disorders like acne and psoriasis. When applied to wounds, it will prevent pus formation and swelling. Ladies have also tried using the paste (made from unripe papaya) and applying to the face. They said this will remove pigmentation, or brown spots and eventually, making the skin smooth and delicate. 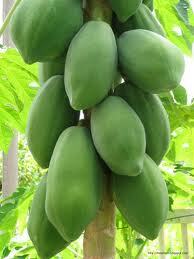 Patients with such problem can cut unripe papaya and immerse them in vinegar for a week. Once ready, consume it twice a day with meals, until the spleen is normalized. Mixed the fresh juice extracted from unripe papaya with raw honey and consume regularly when ones have inflamed tonsils, or other throat disorders. It will coat the membrane, surrounding the throat and prevents further infection. 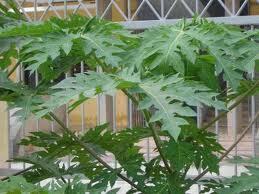 Of late, many users have also found the leaves from Papaya trees extremely useful in the treatment of dengue fever which is caused by a type of mosquitoes carrying virus. Patients with such problem could face a life threatening experience, if left untreated within a matter of days. To apply .... leaves are plucked, cleaned and grounded to extract its juices. It is best to add a small amount of water and a tablespoon of raw honey before drinking it straight. This is to neutralize the bitter taste of the juice. Continue drinking for a few days. There are already good testimonials supporting this simple treatment method. KUALA LUMPUR : Papaya leaves and pegaga (centella asiatica) juice are a possible cure for dengue fever, a recent study revealed. It has been reported that many people consume papaya leaves, or pegaga juice to increase their platelet count after they contract dengue fever. The study was initiated and led by Dr S. Kathiresan of AIMST University. 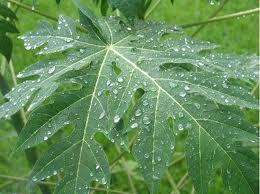 Green remedy : Researchers find the powder from papaya leaves contains substances that promote the production of platelets. 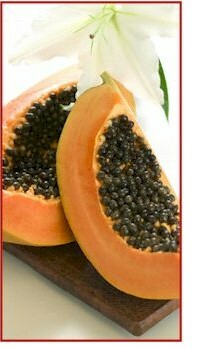 Dr Kathiresan said the leaves of papaya fruit were high in complex vitamins that might help bone marrow to rapidly increase blood platelet production. 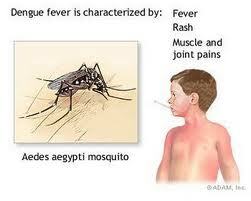 “Dengue fever continues to be a major health threat to Malaysia after its first reported outbreak in 1902. “The dengue virus’ main effect is on platelet production. Nor­mally, a platelet in our body lasts for about five to 10 days and the body replenishes them when required,” he told Bernama. Once such bleeding starts, the situation is almost irreversible, he said. Dr Kathiresan noted that interest in the papaya began with a simple experiment with papaya leaves which were ground and administered to mice. According to the annals of the Ayurveda (India’s old tradition of medicines), the leaves of the Moringa Tree could treat at least 300 diseases. 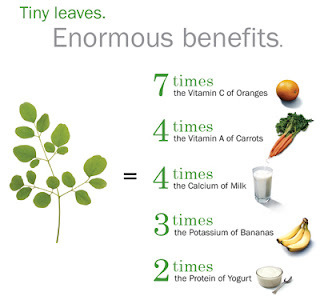 Moringa leaf has no proven bad effects and is absolutely safe and organic. Because of its tolerant properties, it has been given to malnourished little babies in Africa. Athletes all over the world boost their performance abilities by taking huge quantities of the leaf to keep them fit both mentally and physically. It is their secret weapon. Even for senior citizens who are losing their sharpness of mind, the Moringa tree leaf could be a great help. In fact the powder is suitable for people from any age group. The Moringa leaf is comparatively an unheard name in spite of the fact that it has been found mentioned more than two thousand years before, and the World Health Organization has been observing and utilizing the tree for more than forty years now as a cheap health supplement in the poverty-stricken countries the world over. There is a reason behind this. The selling of all kinds of health supplements, minerals and vitamins is a lucrative business. No big company would ever take the risk of introducing a name that could potentially harm and lower the sale of all other nutritional items. 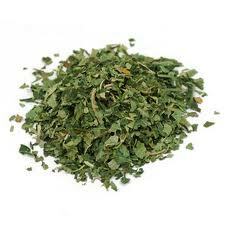 Moringa leaves can be consumed fresh, cooked or dried. Since dried Moringa leaves retain their nutrient content, it is possible to convert them into leaf powder. Moringa Leaf Powder is an excellent nutritional supplement and can be added to any dish. 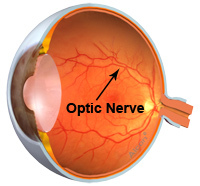 What is Leber Hereditary Optic Neuropathy ? This is a form of eye disease of a serious kind, and mostly untreated child will go blind within a short period. Should parents discovered any irregular sign & symptom involving the eyesight of their school going children, or any working teenager who complained about unexplained and sudden loss of their central vision, they should seek immediate attention from a renowned eye specialist. It is important to ask them to check out for LHON, so that your sight might be restored in time. One must find a medical professional who is aware of the most current research regarding LHON, as there has been much new learning in recent years and the condition is so rare that most medical professionals are not up-to-date on recent developments. Sadly, I have known of a few cases where the patients are suffering from such eyesight problems. In spite of many frequent visits to their family eye doctors, their problems were not detected. Eventually, they were blind. Once blindness set in, it will be a permanent disablement. Imagine, when your retina cells degenerated and affected your optical nerves ....and your only means of transmitting image messages to your brain has stopped, what will become of your invaluable eyesight ! Unfortunately, this sickness can only be determined through a thorough blood test for LHON. Leber hereditary optic neuropathy (LHON) is an inherited form of vision loss. Although this condition usually begins in a person's teens or twenties, rare cases may appear in early childhood or later in adulthood. For unknown reasons, males are affected much more often than females. Blurring and clouding of vision are usually the first symptoms of this disorder. These vision problems may begin in one eye or simultaneously in both eyes; if vision loss starts in one eye, the other eye is usually affected within several weeks or months. Over time, vision in both eyes worsens with a severe loss of sharpness (visual acuity) and color vision. This condition mainly affects central vision, which is needed for detailed tasks such as reading, driving, and recognizing faces. Vision loss results from the death of cells in the nerve that relays visual information from the eyes to the brain (the optic nerve). Although central vision gradually improves in a small percentage of cases, in most cases the vision loss is profound and permanent. Painless vision loss is typically the only symptom of Leber hereditary optic neuropathy; however, some families with other signs and symptoms have been reported. These cases are described as "LHON plus." In addition to vision loss, the features of LHON plus can include movement disorders, tremors, and abnormalities of the electrical signals that control the heartbeat (cardiac conduction defects). Additionally, some people with Leber hereditary optic neuropathy develop features similar to multiple sclerosis. Multiple sclerosis is a chronic disorder that affects the brain and spinal cord (the central nervous system), causing muscle weakness, poor coordination, numbness, and a variety of other medical problems. The prevalence of Leber hereditary optic neuropathy in most populations is unknown. It affects 1 in 30,000 to 50,000 people in northeast England and Finland. About 100 people in the United States lose vision due to LHON each year, joining the 4,000 or so Americans who are already vision impaired due to LHON. Thousands more carry a LHON genetic mutation, and they could suddenly lose their vision at any time. It’s estimated that about 35,000 people worldwide have LHON vision. Mutations in the MT-ND1, MT-ND4, MT-ND4L, and MT-ND6 genes cause Leber hereditary optic neuropathy. These genes are contained in mitochondrial DNA. Mitochondria are structures within cells that convert the energy from food into a form that cells can use. Although most DNA is packaged in chromosomes within the nucleus, mitochondria also have a small amount of their own DNA (known as mitochondrial DNA or mtDNA). The genes related to Leber hereditary optic neuropathy each provide instructions for making a protein involved in normal mitochondrial function. These proteins are part of a large enzyme complex in mitochondria that helps convert oxygen and simple sugars to energy. Mutations in any of the genes disrupt this process. It remains unclear how these genetic changes cause the death of cells in the optic nerve and lead to the specific features of Leber hereditary optic neuropathy. A significant percentage of people with a mutation that causes Leber hereditary optic neuropathy do not develop any features of the disorder. Specifically, more than 50 percent of males with a mutation and more than 85 percent of females with a mutation never experience vision loss or related medical problems. Additional factors may determine whether a person develops the signs and symptoms of this disorder. Environmental factors such as smoking and alcohol use may be involved, although studies of these factors have produced conflicting results. Researchers are also investigating whether changes in additional genes, particularly genes on the X chromosome, contribute to the development of signs and symptoms. How does a person inherited LHON ? This condition has a mitochondrial pattern of inheritance, which is also known as maternal inheritance. This inheritance pattern applies to genes contained in mitochondrial DNA. Because egg cells, but not sperm cells, contribute mitochondria to the developing embryo, only females pass mitochondrial conditions to their children. Mitochondrial disorders can appear in every generation of a family and can affect both males and females, but fathers do not pass mitochondrial traits to their children. Often, people who develop the features of Leber hereditary optic neuropathy have no family history of the condition. Because a person may carry a mitochondrial DNA mutation without experiencing any signs or symptoms, it is hard to predict which members of a family who carry a mutation will eventually develop vision loss or other medical problems associated with Leber hereditary optic neuropathy. It is important to note that all females with a mitochondrial DNA mutation, even those who do not have any signs or symptoms, will pass the genetic change to their children. There is no cure for LHON, but there are several research centers around the world where LHON is being studied. Even though there are relatively few people affected by LHON, there are many researchers working on it because as a mitochondrial disorder it is similar in nature to diseases such as Alzheimer’s, Huntington’s and Parkinson’s, which impact large numbers of patients.